My sweet baby clapping when I walk in her room in the morning, that makes me happy. Looking in the floor and seeing the entire contents of my purse spread all around her, that makes me happy. Going on a date with my husband, that makes me happy. 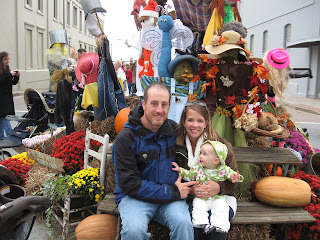 Getting all bundled up and walking through the shops at the Fall Festival, that makes me happy. Rocking that little girl to sleep, that makes me happy. Cleaning banana mush off of little tiny hands, that makes me happy. My husband helping with my coat and opening my car door for me, that makes me happy. A hand-written thank you card in the mail, a walk in the park, autumn leaves falling on my car, a good book, a sweet comment on Facebook, a new page in Layla's scrapbook, a successful arts and crafts project, a yummy batch of cupcakes, a big bowl of chili, a successful week at Weight Watchers, a trip to Target, an experimental dinner that turns out to be delicious, a night with family, holding the door open for someone coming in behind me, sweet potatoes, a neatly made bed, Glee... These things all make me happy. But what makes me happiest is my little family... my husband who never gives up on me, and my Layla who has no idea that I'm not perfect.